The fight for America’s soul is upon us, and the arid lands of Bunkerville, Nev., are the key battleground. On a ranch near Nevada’s southern tip, an American hero is standing up to an oppressive federal government. And freedom is winning. That, at least, is how many libertarians, extreme conservatives and anti-government campaigners view it. Here are the facts: Cliven Bundy, a 60-something Nevada rancher, allowed his cattle to graze on federally owned land for 20 years in violation of the law. After a protracted court battle, the U.S. Bureau of Land Management (BLM) slapped the rancher with $1 million in accumulated fines. Bundy has no intention of paying. The BLM, like a bank with a delinquent mortgage, seized Bundy’s cows. In the process, it arrested one of his 13 children and assaulted another. The incident was captured on video, which went viral on the Internet. And that’s how a local dispute over a few heads of cattle flared into a national rallying point for anti-government groups—with conservative media and even a few Republican politicians helping to fan the flames. But a further explanation lies in recent history. In 1992 a standoff at a cabin on a northern Idaho mountaintop called Ruby Ridge between white supremacist Randy Weaver and his family turned deadly when FBI snipers shot dead Weaver’s son and his wife. For the next nine days, federal agents laid siege to the compound. A year later, the FBI besieged a compound in Waco, Texas, belonging to the Branch Davidians, a religious sect accused of holding illegal firearms. By the time the siege was over, 76 people, including women and children, had burned to death in a conflagration that may have been started by the cult’s leader, David Koresh, or perhaps by the federal agents. In 1995, Timothy McVeigh, a militia movement member motivated by the killings at Ruby Ridge and Waco, bombed a federal building in Oklahoma City, killing 168 in the second deadliest act of terrorism in American history after the Al-Qaeda attacks of September 11, 2001. After McVeigh was found guilty of murder and executed, the anti-government patriot right largely retreated due to government crackdowns and changing perceptions. Many believe that BLM agents did not want at Bunkerville a repeat of the tragic scenes at Waco and Ruby Ridge. 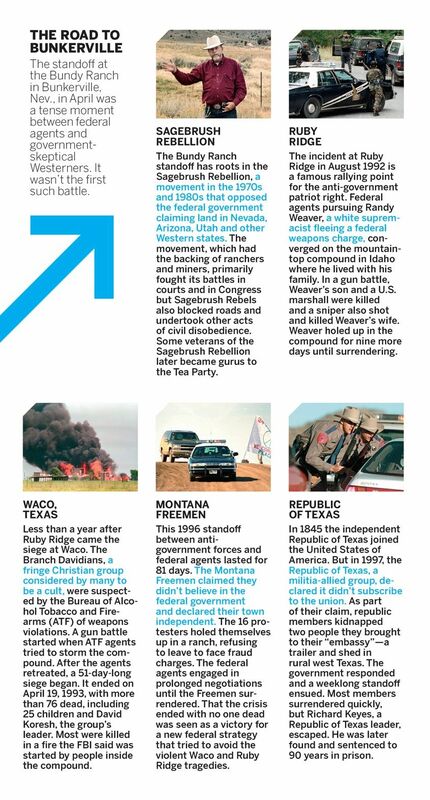 Ruby Ridge and Waco helped catalyze the anti-government patriot movement, which is now mobilizing in support of Bundy. Many came to the protest with loaded firearms. The anti-government movement is nothing new. “This is a continuing, recurring phenomenon in the American political landscape, one that ties into both a hatred of American government as it’s conceived by them as well as a deep-seated gun culture,” said Devin Burghart, vice president of the Institute for Research and Education on Human Rights, who has studied extremist groups in America for years. The ideologies of the militia movements are eclectic. Conspiracy theories about a “New World Order” and the United Nations as the instrument of world government feature heavily. Some advocate not just expanded states’ rights but sovereignty for counties, too. 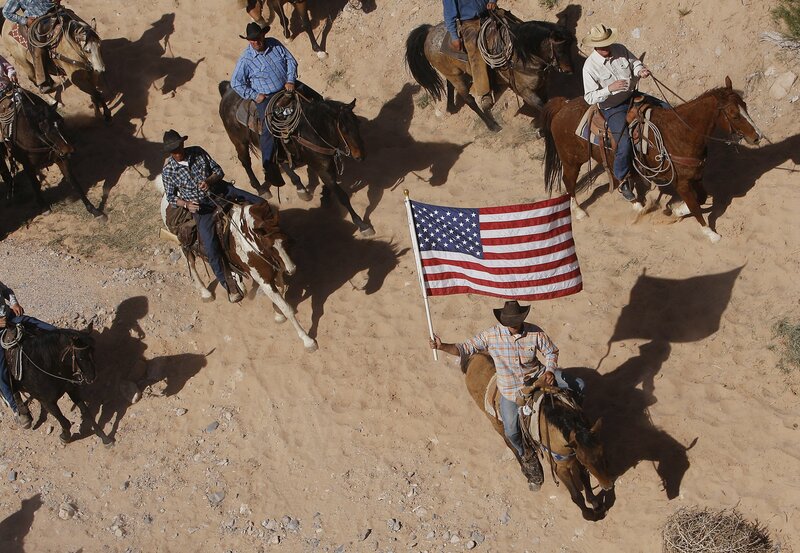 The Bundy ranch standoff suggests that the militiamen never went away. But something is different this time. It’s not only fringe militiamen lending support to Bundy. Some Republican politicians and many in the conservative media have also made Bunkerville into a cause célèbre. 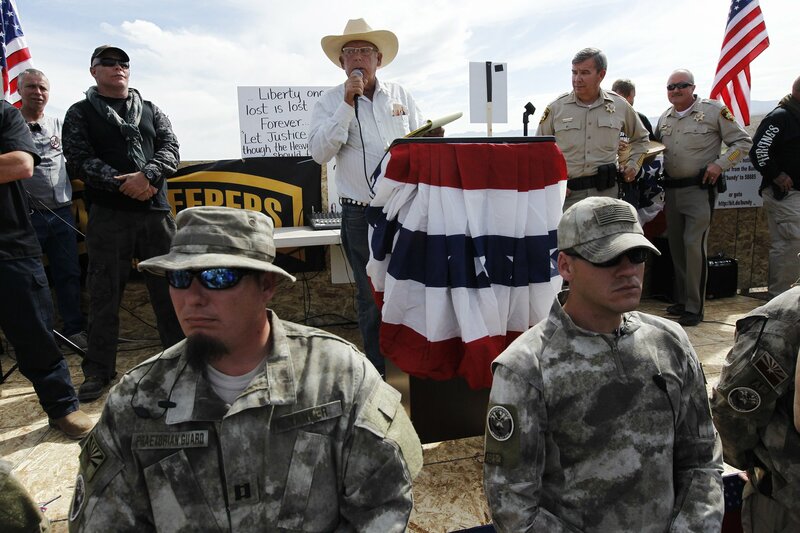 Several local Republicans traveled to the Bundy ranch to show their support for the militiamen and anti-government patriots. He added, “[The standoff] was about freedom. It was about property rights, Second Amendment rights, free speech rights. All those issues. Not everyone sees everything the same way, but it wasn’t about grazing costs.” Four other Arizona legislators stood with Bundy. Republicans on the national stage are also lending support. Ron Paul, a libertarian-leaning former Republican congressman from Texas, compared the situation to Waco and voiced his admiration for the Bundy ranch crowd. Conservative media have also helped fan the flames. Fox News’s Sean Hannity has invited Bundy onto his show twice. Conservative news site The Drudge Report has touted a theory, put forward by some, that the truth behind the Bundy ranch affair is that Nevada’s Harry Reid, the Democratic Senate majority leader, wants to claim the land for a solar energy deal with a Chinese company, a theory that hasn’t stood up. Corrections: An earlier version of this story incorrectly named the group of law enforcement and military members who swore an oath to uphold the constitution, they are the Oath Keepers. Also, Ron Paul is a former congressmen.